The Erbe-Verb is more than a collection of reverb algorithms or presets, it is a unique, modeless, continuously variable reverb algorithm with complete voltage control. Typical reverb types such as plate, room, hall, shimmer and others may be programmed by adjusting the knobs. The continuously variable algorithm allows for hybrid and unreal spaces to be found. Traveling between spaces is possible by modulating the algorithm or manually sweeping parameters. 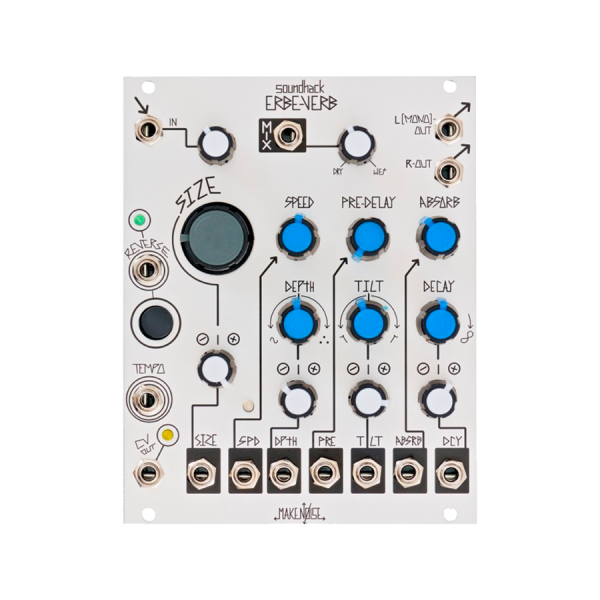 More than an end-of-chain effects unit, it's a whole new building block for modular synthesis. Like the Echophon, it's coded by Tom Erbe of soundhack. Size ranges from "coffin" to "the heavens"
CV Out completes the conversation between Erbe-Verb and rest of system! Make Noise ble grunnlagt i 2008 av Tony Rolando, en selvlært designer av elektroniske musikkinstrumenter. Tony fant sin kunnskap gjennom årevis av lesing av amatør radiobøker, i tillegg til å få seg en jobb hos Moog Music, som er lokalisert i Asheville NC hvor nå også Make Noise har sitt hovedkvarter.